Reverend Donovan A. Coley Sr. is the President and CEO of The Fort Wayne Rescue Mission (The Rescue Mission) located at 301 West Superior Street, Fort Wayne, Indiana, 46802. USA. Pastor “D” is a Preacher and Evangelist at heart. Pastor “D” has established this Website as an online presence to his preaching ministry. 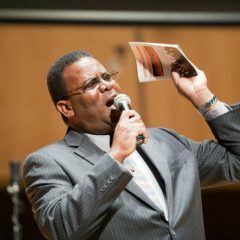 While his ministry priority is The Rescue Mission, Pastor “D” is sought after to fill the pulpits and podium of many churches and organizations. Outside of The Rescue Mission, Pastor “D” is a member of “The Discipleship and Stewardship Network.” This network works together to encourage discipleship, and Godly stewardship for people who are in the pursuit of living the abundant life spoken of in the Bible by Jesus in John 10:10.